When the British troops reached Concord at about 7 a.m., they found themselves encircled by hundreds of armed Patriots. 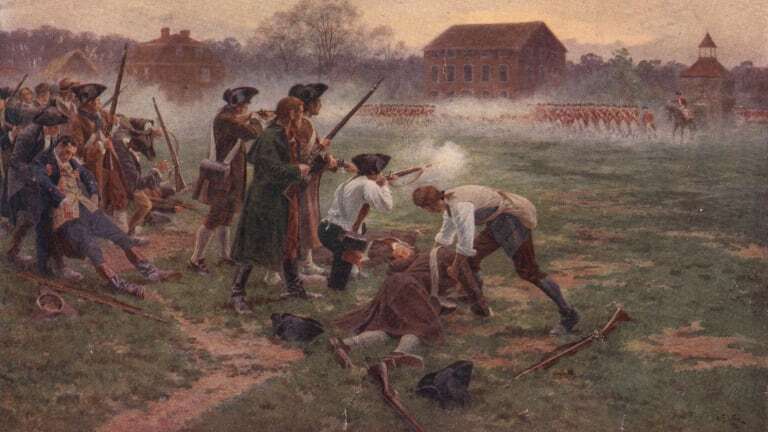 They managed to destroy the military supplies the Americans had collected but were soon advanced against by a gang of minutemen, who inflicted numerous casualties. Lieutenant Colonel Francis Smith, the overall commander of the British force, ordered his men to return to Boston without directly engaging the Americans. As the British retraced their 16-mile journey, their lines were constantly beset by Patriot marksmen firing at them Indian-style from behind trees, rocks, and stone walls. At Lexington, Captain Parker’s militia had its revenge, killing several British soldiers as the Red Coats hastily marched through his town. By the time the British finally reached the safety of Boston, nearly 300 British soldiers had been killed, wounded, or were missing in action. The Patriots suffered fewer than 100 casualties.